Coping with a diagnosis of celiac disease or food allergies and learning to eat healthfully can have some very key things in common: they teach you to look for alternatives to what you formerly consumed. They teach you to combine foods in new ways. They teach you to seek out foods you formerly wouldn’t have eaten—or eating as often—and learn to enjoy those foods immensely. Combining the diagnosis eating with the healthful eating can be even more of a challenge, or, to look on the bright side, even more of an adventure. This past week, I made an easy homemade vegetarian chili in about 20 minutes. I had bought some chili-ish ingredients (canned beans, canned tomatoes, frozen corn, fresh red pepper, etc. ), and I just made it up as I went along until it looked and tasted right. I did throw in an ounce of dark chocolate so that my chili would have that touch of richness and sweetness to contrast with the starchy, salt-sprinkled potato. I spread some soft goat cheese inside each slow-baked potato, poured the chili in, and topped it all with chopped cilantro and green onions. Mmm delicious, and very filling: a great, easy winter meal. Something else I’ve realized lately is that I love me some tacos. Actually, I already knew that I loved tacos. But what I realized, or remembered, is that at several restaurants over my lifetime, I have loved ordering soft corn tacos filled with less conventional taco fillings. Fish tacos are one of my favorite foods. (I know they’re common elsewhere, but many people in the South look at them askance.) I’ve had tacos filled with fried chicken, tomato slices, and honey mustard. Yum. And so on. Last week, when I was developing a cold and just wanted a quick dinner, I was trying to figure out how to make the tacos I had planned for dinner less labor-intensive. Then I noticed my leftover gluten-free pulled pork and gluten-free, dairy-free, soy-free coleslaw. Voila. Pork and coleslaw tacos. Tasty and easy. 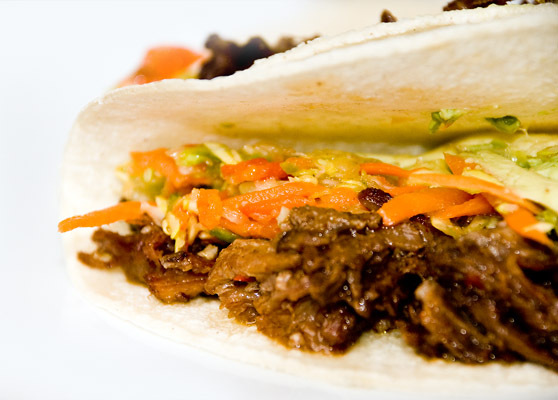 I’m going to be running with this unconventional taco idea in various directions for a long while. . . . Ideas, anyone? I really liked that you looked at your situation as an adventure … instead of a misfortune after getting over the initial panic. You mentioned something similar before and this is what made me fall in love with your blog! Your attitude made my day. oh yum! tacos and potatoes are two of my faves and i love the idea of your veggie chili on top of the potatoes….plus you made me laugh describing potatoes as big as your head (so true!!). we eat fish tacos all the time (can’t remember if fish is a problem for you and i’m very short on time) with cabbage slaw and that’s one of our favorites (we grill the fish). hope you’re having a great day, sally! Mmm mmm mmm! Your tacos sound delightful. I’ve been such a taco traditionalist – I will have to branch out now. Thanks for the comment on my blog. I commented back thanking you, and then realized you might not see it there. I’m going to repeat myself here. Your advice is *very* helpful. I’m such a newbie at the running thing. It’s a little intimidating. oooo, dark chocolate in your chilli? Of course! It makes perfect sense…we eat chilli chocolate, why not choc in your chilli? I’m reeling at the simplicity of it! Sally – I love the photo of the baked potato! I’m hungry right now and that looks awesome. Another good use for potatoes is to thicken stew or soups. When I bake potatoes, I bake a couple of extras and keep them in the fridge for later. If I need to thicken some soup, I just blitz part or all of a potato in the blender with some broth and add to the soup. Presto, thickness with no flour or cornstarch. Oh, I also gave you an egg substitute for baking on my blog – on the GF bread post. Sally- I really appreciated your advice on my blog, so I thought I would check yours out. I must say, I admire your attitude! I will definitely keep reading; it’s very inspirational. As for the tacos, I think the less conventional the better. The pork and coleslaw taco sounds great! Thanks for stopping by my blog. Your food ideas sound yummy! 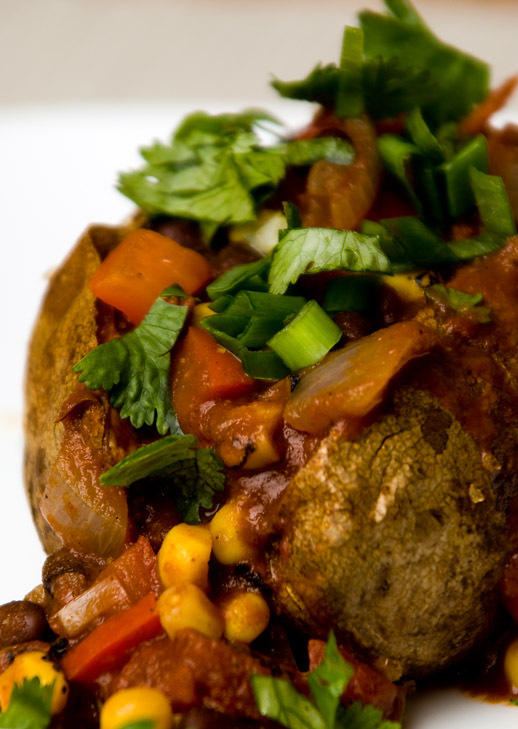 I’ve never thought of putting goat cheese in a baked potato with chili, but it sounds great. As a Southerner, I’ve never tried fish tacos. But I’d like to! It is funny …. well not really …. but I use to wish I was allergic to food so I would lose weight. Now watching friends struggle, I realize how difficult it can be. Your recipes sound so yummy! I have a Thai Chicken Wrap recipe that made me fall in love with broccoli slaw. It is always on sale because it apparently doesn’t appeal to everyone but it is a good addition to a taco, yummy! The potato looks fantastic too. I love fish tacos too, and so cheap (tilapia $2.99/lb.)! Sally, I have been making your blue cheese recipe every Monday and I love it so much. (I use FF Greek Yogurt). Thank you for posting that recipe. LOL, since being diagnosed gluten-intolerant, I’ve noticed my favorite thing is a baked potato. I just made my boyfriend read this post because I had been talking about my love of baking potatoes. I LOVE the idea of a baked potato of the week! Thanks for stopping by lookinatcookin blog. I admire your strength in firmly going forward with life and not being overwhelmed by your allergies. I love looking at your food pics. Everything looks so yummy.